Nineteen thirty-one marked the Model A’s final model year. MotoeXotica Classic Cars is pleased to present this 1931 Model A Sports Five Window Coupe, one of 19,700 such models made in 1931. This steel-bodied example is dressed in Brewster Green over Kewanee Green over black. The paint is in very good order overall, with just blemishes upon close inspection. The car’s bodywork is straight, its engine bay is very tidy and the dual bar chrome bumpers are in very good order. In place of the trunk is a two-passenger rumble seat. Note that this car has a driver’s side windshield wiper and taillight only. Other exterior features include running board step plates, cowl lamps, an exterior sun visor and a radiator stone shield. This Model A rolls on Firestone Gum-dipped whitewall tires, size 4.40 to 4.50-19. Each one surrounds a Lime Green Ford Wire Wheel with a center cap. The tires are in very good order while the wheels are in satisfactory shape. A spare tire and wheel within a protective liner hangs off the rear of the car. Under the hood is Ford’s 201 CID inline four-cylinder, equipped with a Zenith carburetor. Backing this motor are a three-speed sliding gear manual transmission and a 3.77:1 differential. Other mechanical features include transverse front leaf springs, semi-elliptical rear leaf springs and mechanical drum brakes. There’s a Boyce Motometer as part of the radiator cap; it allowed the driver to check the coolant temperature from the driver’s seat. Inside, the car’s tan interior is in overall very good order. The interior was restored with new upholstery from LeBaron Bonney. The bench seat is in great shape while floor mats keep the floor in satisfactory order. The original four-spoke steering wheel looks good while the green metal instrument panel looks fine but the odometer is inoperable. The inner door panels are in decent condition and even feature map pockets. Leading the list of styling changes that year was a radiator shell with a relief effect plus running boards with single-piece slash aprons. Two-door models had smoother rooflines. 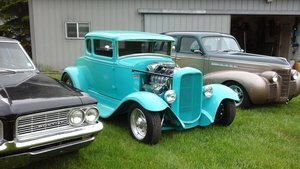 After a five-year run, Ford pulled the plug on the Model A; less than one-third of the years Ford made the Model T. The Model A’s much shorter production run illustrated not just the harsh economic climate of the early 1930s but also how Ford’s competition caught, and in some area, surpassed Ford. Documentation includes Model A Instruction Book, engine “break-in” instructions and various maintenance and parts receipts from 1997 to 2002. Competition to this Ford in 1930 included Chevrolet’s AE Independence Rumble Seat Coupe, Dodge’s Series DD Coupe and Oakland’s Series 301 Sports Coupe. This car is currently located at our facility in St. Louis, Missouri. Current mileage on the odometer shows 4,533 miles. It is sold as is, where is, on a clean and clear, mileage exempt title. GET OUT AND DRIVE!! !